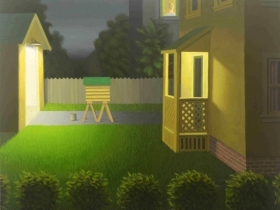 Illinois artist Mark Forth’s paintings, at Tory Folliard Gallery, turns familiar American scenes into an eerie world. “My paintings enter a realm of stillness and shadow, where antique furnishings, austere architecture and eerie lighting become interpreters for mute figures that stand, crouch, or recline impassively,” wrote Forth in an artist statement. But in his latest exhibit, his paintings are mostly devoid of human figures, adding to the feeling of loneliness and distrust of others. Although Forth paints middle-class homes with immaculately manicured lawns, they seem like the opposite of the cookie-cutter close-knit communities of yesteryear, with an almost ghost-town feeling. Blue-and-white striped lawn chairs, small benches, and candy-cane-striped vintage swing sets sit empty. The few human figures depicted in the paintings have their backs turned, or their faces obscured. Pets are mostly absent as well (although, oddly enough, one painting bears the name “Building a Place for a Black Dog”). Most of the backyards feature wooden fences; some, even brick retaining walls. Like moats that protect castles, these yards appear to guard against intruders. It’s difficult to imagine them as the scenes for barbecues and children’s birthday parties. Aside from a few minor details (a crisscross slate-gray fence that suggests a rural or farming area; a brick-red gate, a rounded stone entryway that brings to mind Spanish architecture) Forth’s paintings could be set in any American cul-de-sac. Compositionally echoing twentieth-century artists including George Tooker and Edward Hopper (although his paintings lack human figures), Forth employs a number of dramatic and cinematic lighting techniques in contrast to his ominous backdrops. “I think that really highlights these bizarre scenes that are going on,” says Becca Sidman, assistant director of the Tory Folliard Gallery. 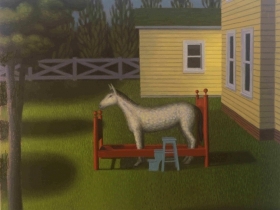 For example, the artist’s 12 x 13 ½ painting “Western” depicts a gray horse (it’s difficult to tell if it is a toy or a live animal) standing in the middle of an antique red bed frame. “Swingset with Crow” (oil on linen over panel, 12 x 13 ½), portrays a crow perched atop a swing set while a woman with nondescript features, clad in a pale green house dress, looks off to the side. Forth’s masterful use of lighting and shadows is especially apparent in paintings like “Building a Place for a Black Dog,” “Mari’s Garden,” and “Swingset (oil on prepared panel, 11 ½ x 14). 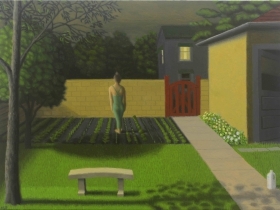 An illuminated solitary figure can be seen through an upstairs window; shadows of foliage are displayed on grass. All works in the exhibit were painted in oil on panel, giving a rich sheen to the work. Born in 1955 in Bloomington, Illinois, where he still lives and works, Forth received his B.A. from Illinois State University and received instruction from master landscape artist Harold Gregor. 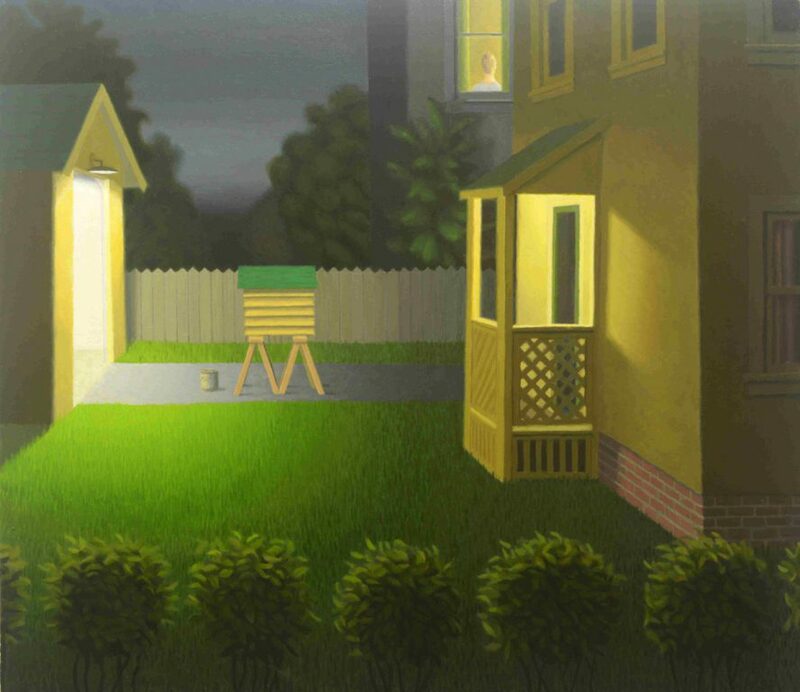 However, unlike Gregor and Hopper, whose paintings are more impressionistic— (also, Gregor is known for his brightly-colored and aerial landscapes with homes that have orange and purple rooftops) Forth’s are rigid, with plenty of symmetrical lines and angles. The artist uses an equal mix of warm and cool colors—lots of slate grays, dark and light greens, reds and yellows. Forth’s paintings, which feature figures who appear to be closed off from society, are reflective of a society that is increasingly fearful of others, somewhat stagnant (each painting is treated like a still life) and fiercely protective of privacy. “New Paintings,” through January 14 at the Tory Folliard Gallery, 233. N. Milwaukee St.